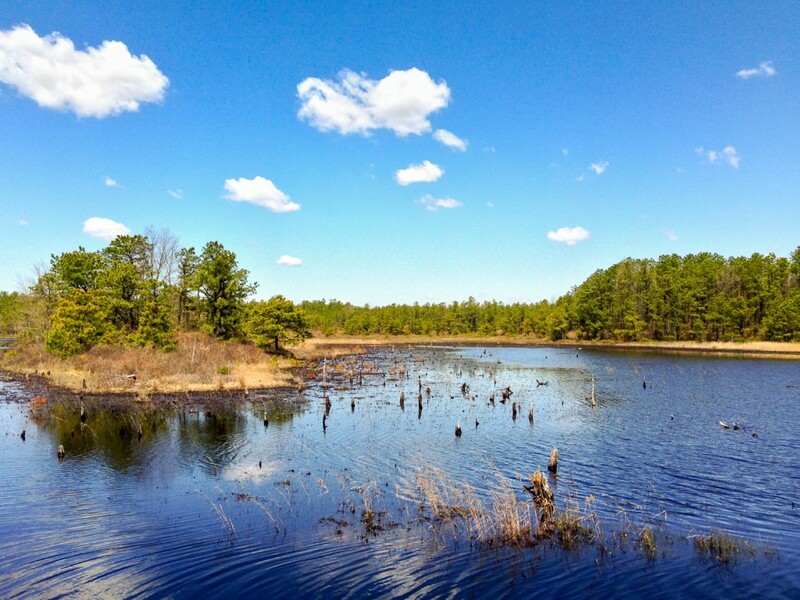 The Franklin Parker Preserve is a 9700-acre nature preserve in Burlington County owned and managed by the New Jersey Conservation Foundation. 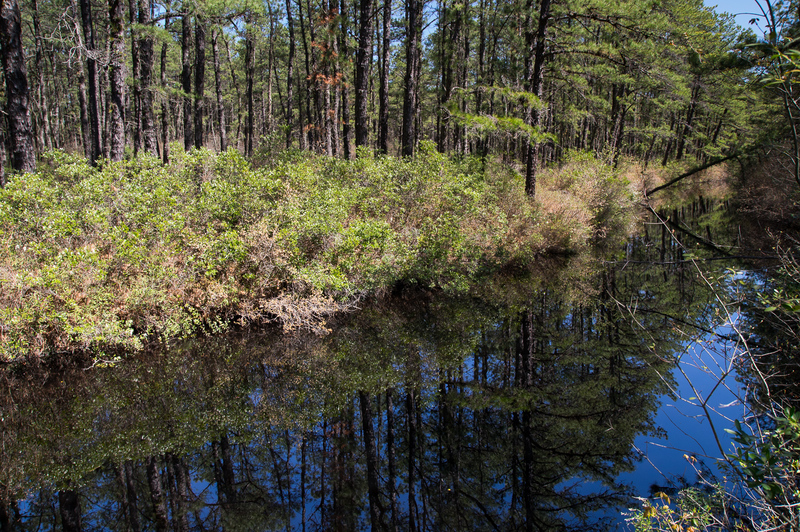 Named for Franklin E. Parker III, the first director of the New Jersey Pinelands Commission, the preserve contains the former cranberry farm of Garfield DeMarco who sold his land to the foundation in 2003, albeit not without some controversy. 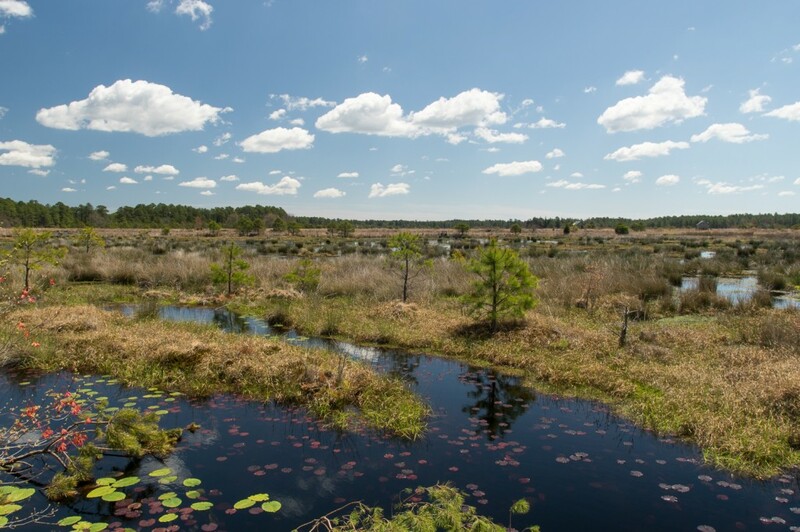 Over the subsequent ten years the foundation, in partnership with the New Jersey Department of Environmental Protection, began to restore the cranberry bogs to their native state and replant stands of Atlantic White Cedar that had been affected by decades of cranberry growing. 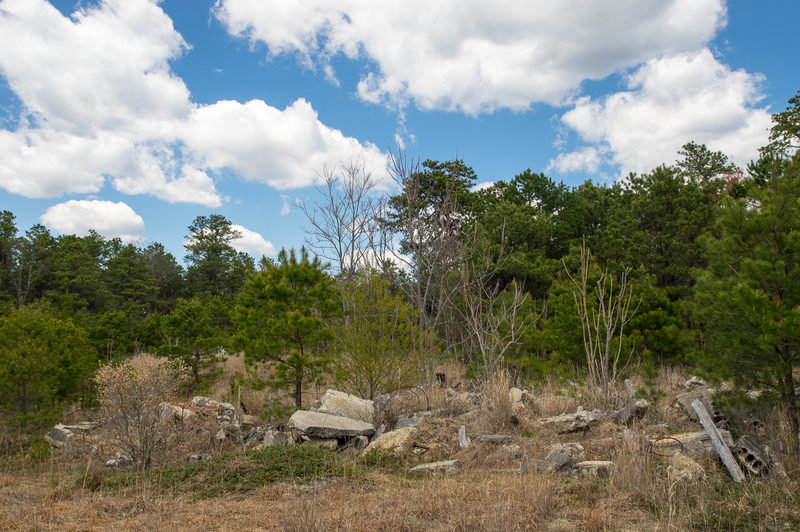 There are 21 miles of hiking trails, including a stretch of the Batona trail that had been rerouted through the preserve to provide a more scenic hiking experience for the trail in this area. There are four main trails: the Green Trail, a 6.7 mile loop that runs along the agricultural roads around the former cranberry bogs; the White Trail, a 3 mile loop that offers spectacular views of the Bald Eagle Reservoir; the Yellow Trail, a 5 mile loop that runs along the cranberry bogs located in the southern portion of the preserve and alongside the west branch of the Wading River. 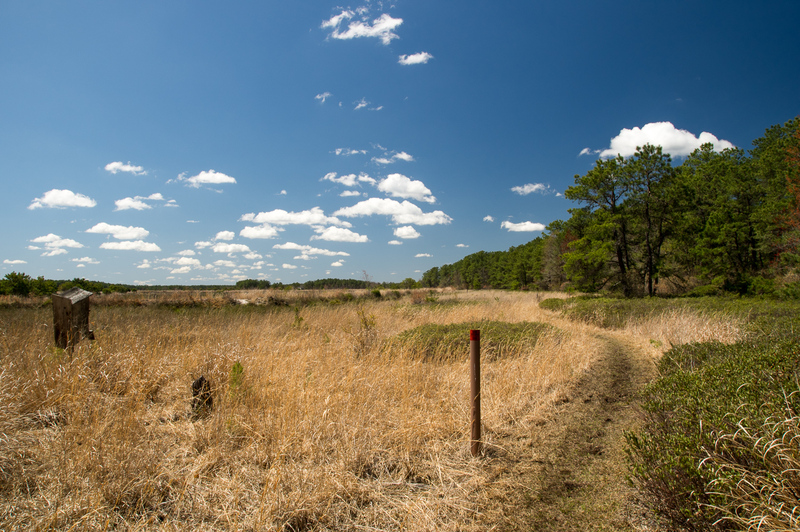 Finally there is the Red Trail, a 6-mile loop that meanders along the bogs and in and out of upland forest and cedar swamps. The Red Trail is a footpath that is open to hiking and cross country skiing only, while the other trails – save for a portion of the Yellow Trail which is only a footpath – are open to hiking, cross country skiing, horses, and cycling. I recently took advantage of some incredible spring weather and hiked the Red Trail for the first time. 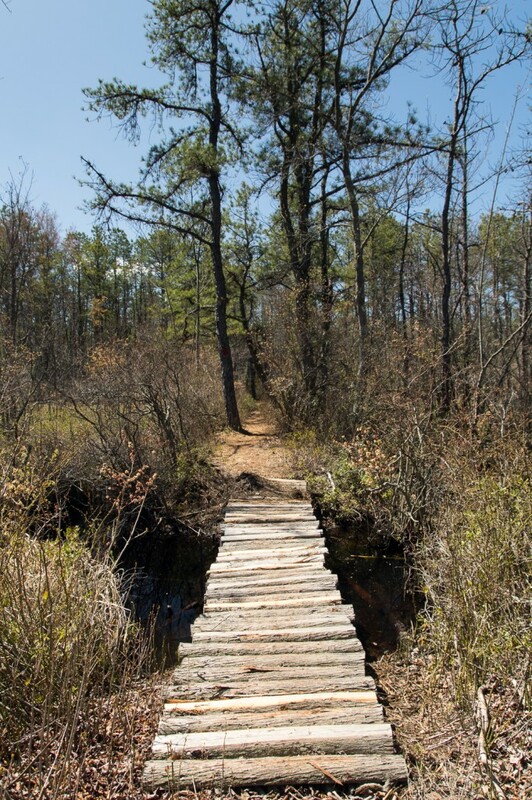 The trail really gives you a nice glimpse of everything that the Pine Barrens offers: pitch pine forests, cedar swamps, cranberry bogs, reservoirs, and even some weird ruins out in the woods. I’m a pretty novice hiker and I found the trail to be fairly easy and enjoyable. The trail begins at the Chatsworth entrance to the preserve. As you’re facing the entrance the trail plunges into the forest on the right just before the gate. Look for the red blazes on the trees. 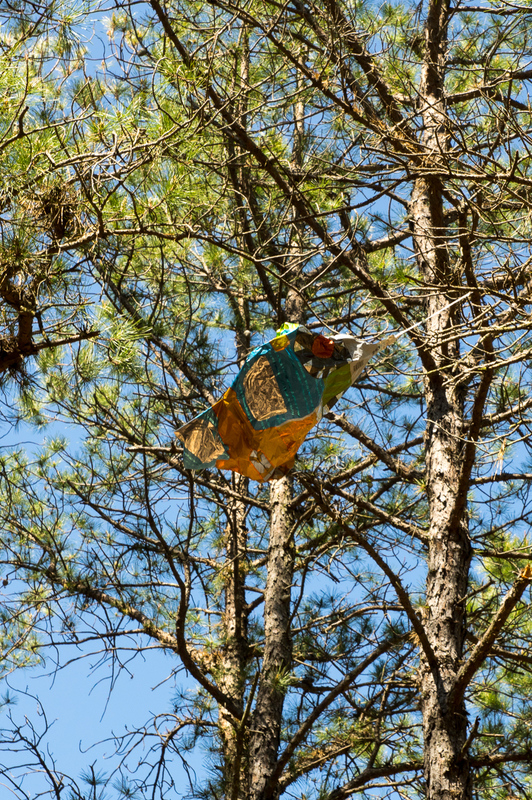 Shortly after I started down the trail I came across a small clearing in the woods and found a silver mylar balloon stuck in a tree. Without fail, I see at least one of these balloons every time I visit the Pine Barrens. It might seem cool to let them float away when the party is over, but they don’t just evaporate into thin air. Eventually the helium escapes and the balloon finds its way back to Earth. This is a huge pet peeve of mine. The trail will meet up with, and run parallel to, Bertha’s Canal. 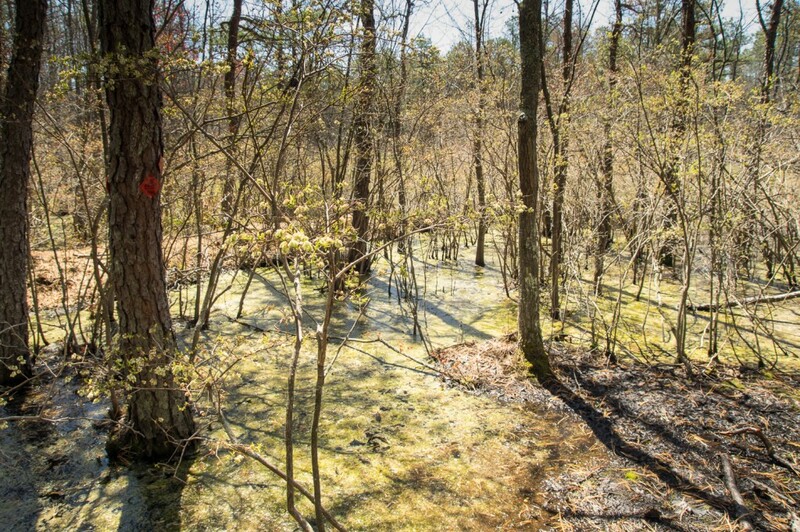 The canal brought water from nearby Chatsworth Lake to fill the DeMarco bog’s reservoir. The waters are quiet, still, and tranquil. The banks of the canal are slightly overgrown so it will be difficult to get a picture without some stray foliage in the foreground. Eventually the canal will intersect one of the branches of the Wading River. You’ll notice a meadow through the trees to your left and the trail nearly doubles back on itself. It’s a little confusing as the blazes for the continuation of the trail are not really obvious. I briefly started down a different path before I realized I had lost the trail. While the majority of the trail is blazed very well, there’s some spots where it’s not readily apparent where you need to go which can be a little frustrating and unnerving. It’s a small, but annoying, quibble I have. The small meadow framed by two young pine trees. From there the trail continues on into some lowlands. Hopefully you have some waterproof boots, because you’ll need them. I was wearing a pair of trail runners and despite my best efforts at leaping from what patches of high ground I could find, my right foot eventually got sucked into some wet mud. This section of the trail could definitely use a little wooden causeway or even some logs thrown down. Here, again, the blazes get confusing. The last blaze is visible on the tree in the picture below, but there’s no apparent trail past that. The trail picks up along a causeway that is 10 or 15 feet further on, with the next blaze further down the trail. It’s not easy to see, and when the vegetation grows in it’ll be even harder. Remembered your boots? 39.80998 N, W 074.55590. A little further down the causeway there is a nice primitive bridge to get you over a cut between two bogs. 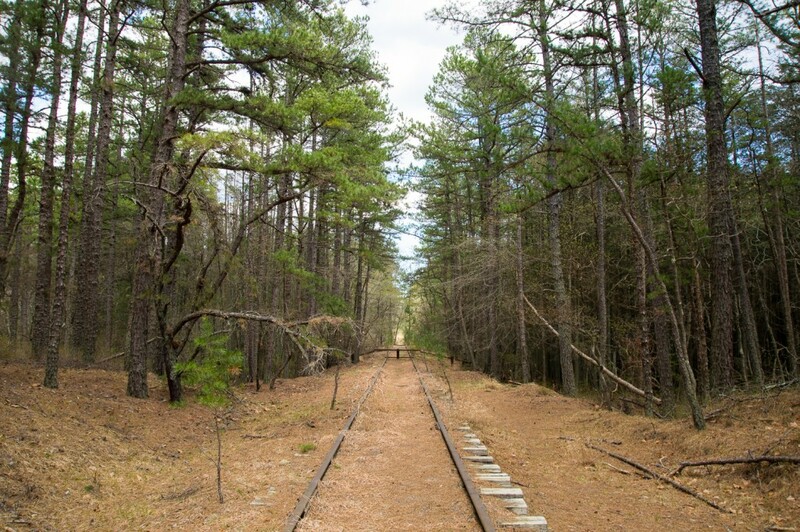 The trail will bring you out to the old Central Railroad of NJ tracks nearly buried in a bed of pine needles. It was near this spot on August 19, 1939 that the famous Blue Comet train derailed, injuring thirty eight people and destroying a section of track. You can still see old railroad ties that were replaced when the track was repaired piled up on either side of the right of way. Crossing over the tracks and continuing on the trail eventually brings you to the most scenic portion of the hike – the DeMarco Cranberry Meadows Natural Area. 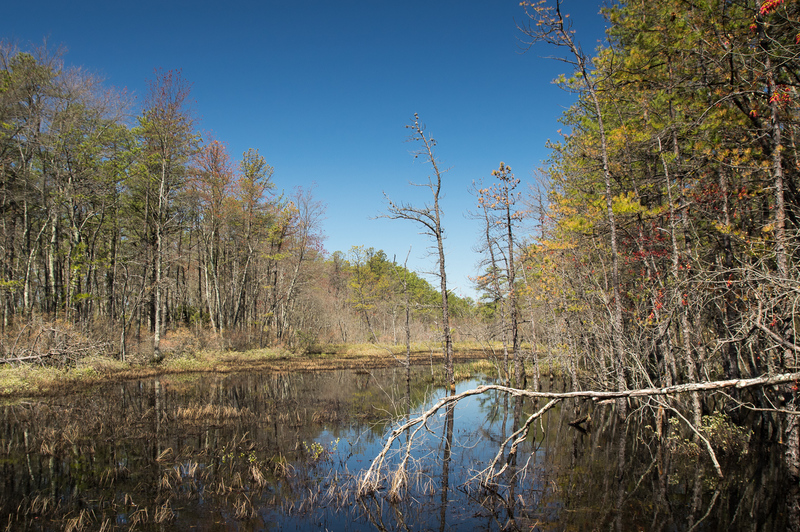 These former cranberry bogs are slowly being reclaimed by nature. If you’re lucky to be there on a beautiful day with a clear sky the view is tremendous. 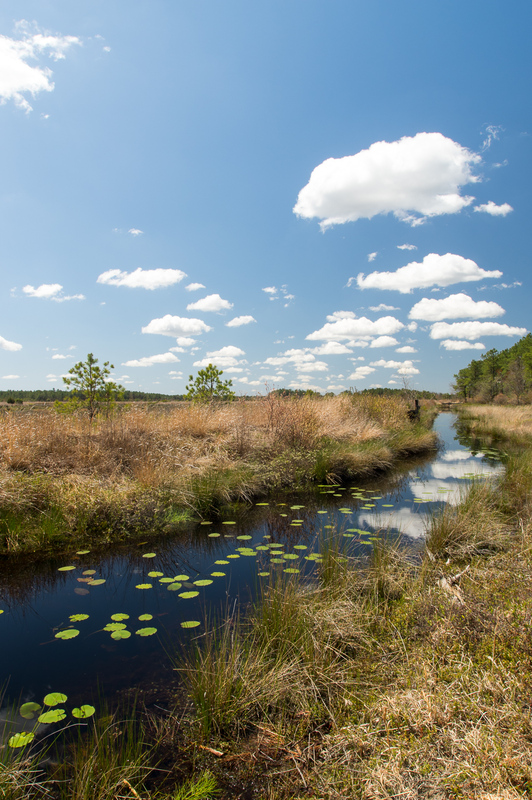 The trail winds around the fringes of the bog and briefly meets up with the Green Trail before heading back into the woods. 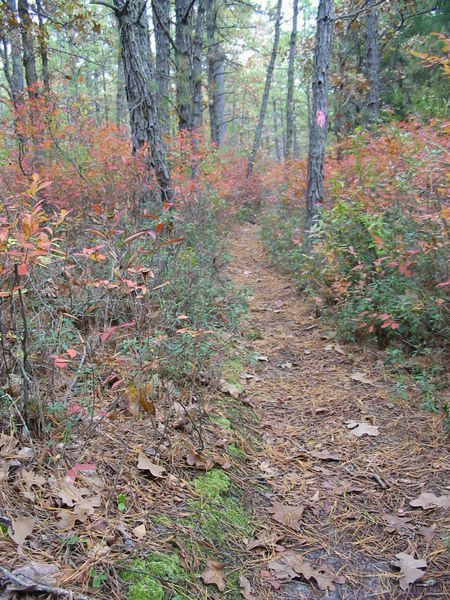 The Red Trail as it enters the DeMarco Cranberry Meadows Natural Area. N 39.80804, W 074.55268. One of the channels dug to move water between the bogs. 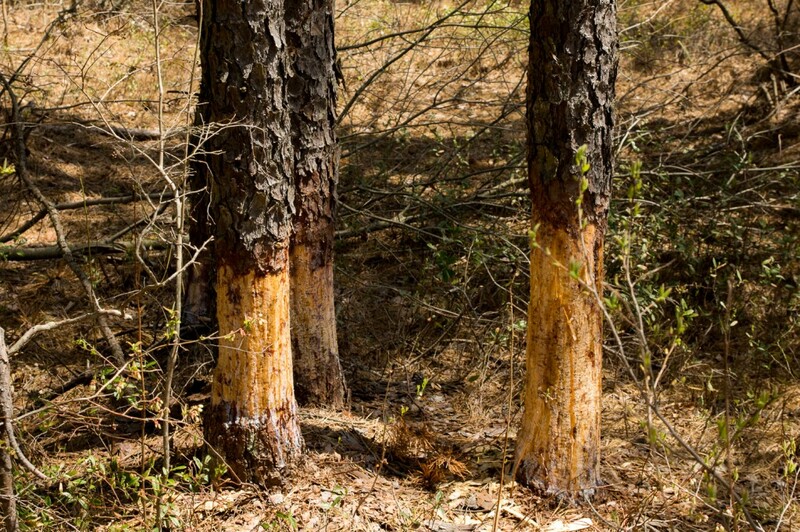 Beavers have been busy working on taking down these three pitch pines. You can’t beat this view! Further on the trail will follow along the reservoir that Bertha’s Canal fed. It’s an incredibly tranquil and idyllic place. The Green Trail mostly follows the old agricultural roads that ring the bogs. At several points in the hike the Red and Green trails converge. Usually the Red Trail follows these roads for a short distance before veering back into the woods. Further along the Red Trail are the ruins of one of the pump houses that moved water between bogs. At one time there was a large pump installed on a thick concrete base. The pump is gone and the building appears half demolished. I’m not sure if it fell down or was vandalized. 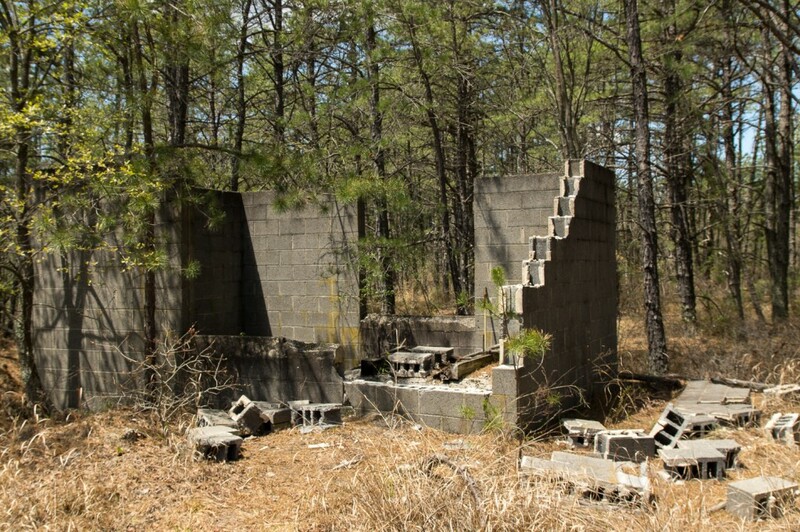 One of the best things about hiking in the Pine Barrens – especially along old abandoned roads – is coming across ruins like these. 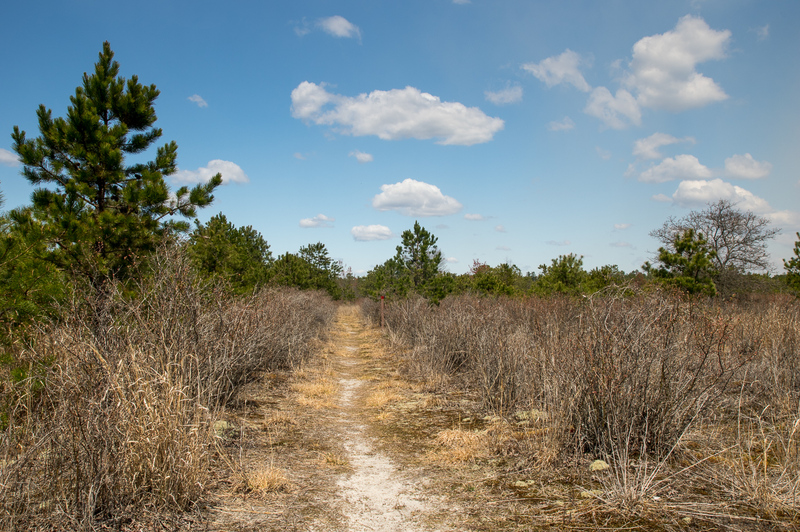 As I mentioned in the beginning of the article the Red Trail gives you a really good impression of what exploring the Pine Barrens is all about. The ruins of a water pump house. N 39.80410, W 074.56269. 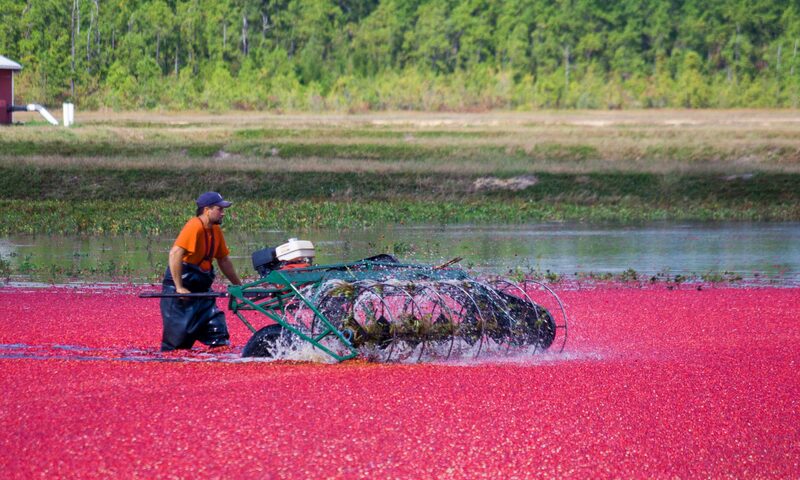 DeMarco didn’t just grow cranberries here. A little beyond the pump house ruins the trail runs in between several rows of blueberry bushes. 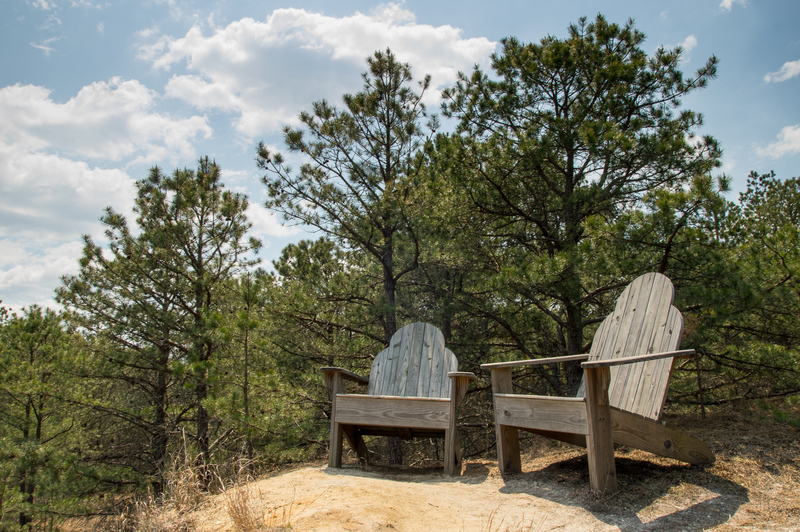 Benches have been placed along the trail at scenic locations, however nothing beats these oversized wooden chairs. They look more fun than they are comfortable. A respite for giants. N 39.79771, W 074.56168. There’s a pretty substantial bridge where the trail crosses the west branch of the Wading River. 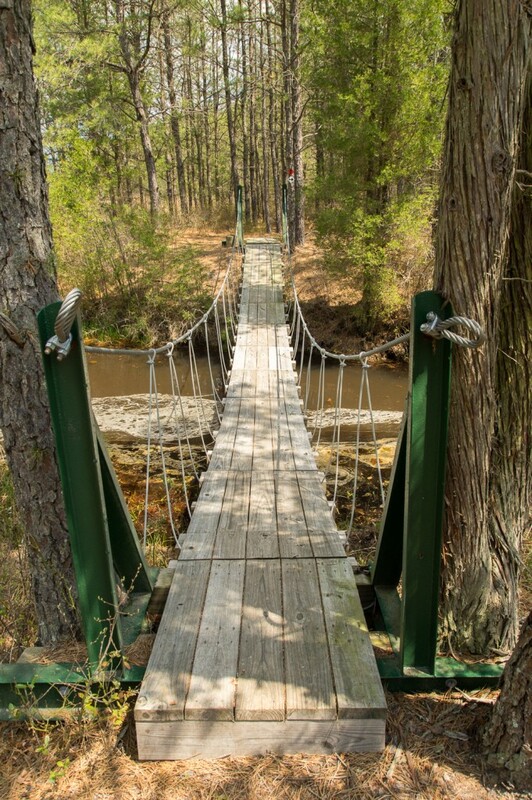 This might be the best built bridge on any hiking trail in the pines. Bridge of the west branch of the Wading River. N 39.79929, W 074.54373. More ruins for good measure. I could not figure out what this building had been used for. At one point in time it had a chimney, so there was either heat or a stove here. Shortly before the trail brings you back to the parking area you will cross the CRRNJ tracks again. There’s an interesting metal barrier put up across the tracks further up the line. It’s been decades since a train has gone down these tracks and pine trees have grown between the ties. There’s nothing for that barrier to stop. Overall I’d say that this is a moderate trail. There’s really not much in the way of elevation changes, although it does get a little hilly in the area before the giant chairs. The most difficult parts are where the trail is wet and when the trail shifts direction and the blazes are hard to find. I would suggest that hikers visit in the winter or spring. It’s a bit overgrown in spots and there’s a lot of vegetation to brush up against as you hike. Ticks and chiggers love it when you brush up against the vegetation they’re waiting on. I was lucky and only found a single tick on me as soon as it hopped on from some brush. As the season progresses it will only get worse. At a minimum wear some strong insect repellant and long sleeve pants and shirt. The trail runs just about 6 miles and took me about 3 hours to complete, hiking at a leisurely pace and stopping often to take pictures. Nov 6, 2004 trip report from a PBX hike of the area. This predates any of the official hiking trails. There is a small amount of information on the history of the Batona Trail available online, but what do we really know about how it all came about? And who really was instrumental in it’s development, how did they get permission to build it, and who gave that permission to allow them to proceed? I am sure over the years many a hiker of the trail asked these questions to themselves, with very little chance of finding the answer. Recently, I acquired the notes of Morris Bardock who was the President of the Batona Hiking Club at the time of the trails inception, and in his writings that he calls “The Batona Trail Diary, the First Thirty Miles,” he answers some of these interesting questions and more. In later years he even worried that the history of the trail would be lost forever, and he made contact with at least one individual to try to insure it was not. I suspect you have never before viewed most of the information you will read below, and this is my attempt to make sure that Mr. Bardock’s worries were for nothing. I have hand typed this text from his diary, and so there always is a chance I made a few mistakes. And there are a few that he made that I have left in, and I have moved some of the text around for better clarity. Hopefully, you will find this as interesting as I have. Enjoy! 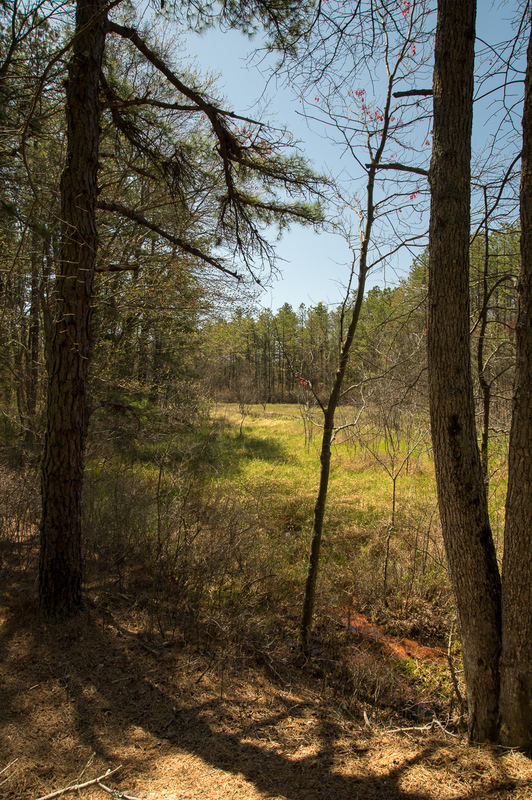 Sometime 1960 – The idea of building a hiking trail through the Wharton and Lebanon State Forests was first suggested by Dale Knapschafer of the Batona Hiking Club. January 20, 1961- A letter was written to State Commissioner Salvatore A. Bontempo, of the Department of Conservation and Economic Development, explaining our plans, and hoping for endorsement. To our pleasant surprise a most favorable reply was received. We were to meet with J. C. MacDonald, manager of Wharton. Just about that time Mr. MacDonald was advanced to a post in Trenton, and our first meeting was held with assistant, Sid Walker. We had earlier received a letter from Mr MacDonald. January 27, 1961- At a leaders meeting of the Batona Hiking Club, Morris Bardock President presiding, building the trail was made an official club project. The Back to Nature Hiking Club of Philadelphia desires to make hiking a popular past time for more people. One contribution our club can make towards this goal is the laying out and maintenance of a hiking trail in an area accessible to a large number of people. We are considering a trail connecting the Wharton Tract and Lebanon State Forest since these areas have many visitors. Also, South Jersey has few if any developed trails: therefore, our project, we feel, would serve a function for the Forestry Service with no cost to the State. The exact route will not be determined until we do more exploring, but it will probably go from Batsto to Pakim Pond or Deep Hollow Pond and beyond. The length will be about twenty miles, but people visiting in Lebanon Forest or the Wharton Tract could take shorter hikes along it. We will try to route the trail near campgrounds and picnic areas to make it easy to use. We propose to use existing sand roads and trails to go across country only where necessary. Therefore the forest will not be harmed by the trail. 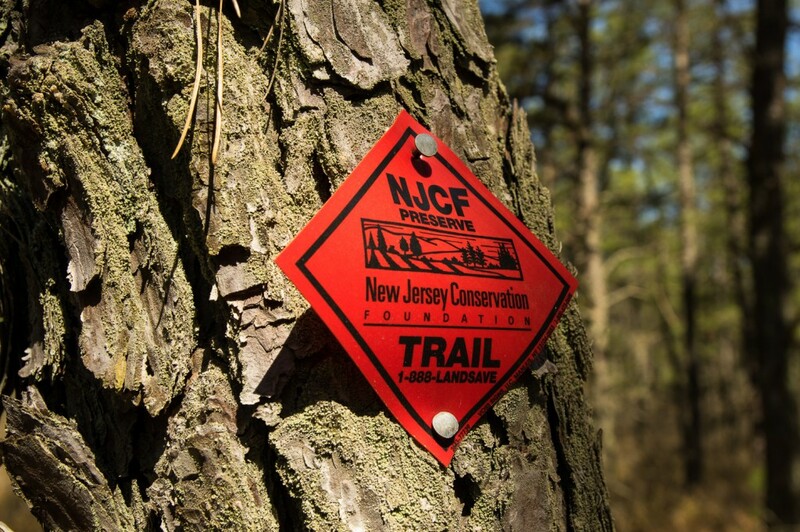 The entire trail will be marked by painting blaze marks on trees at necessary intervals. On cross country sections we could simply mark the trail following an accessible route. We might perhaps clear out a little debris where it would greatly impede walking. The Back to Nature Hiking Club is thirty-two years old and the most active in Philadelphia. The trail work will be done by competent out-of-doors people who have been hiking for years. We are conservation minded and can assure you that no damage would be done to any trees or vegetation. The main purpose of this letter is to obtain the sanction of our State Forestry Service before undertaking this work. When completed, we would send you a detailed route of the trail and it’s name. Enclosed please find one of our schedules which will help to acquaint you with our organization. Thank you for your letter concerning a hiking trail in the Wharton and the Lebanon State Forest. I have asked Mr. J.C. MacDonald, General manager of Wharton Tract and Mr. J. P. Allen, Superintendent of the Lebanon State Forest to see if there is anything they can do to be helpful. Mr. MacDonald will be in touch with you directly. I am pleased to know of the interest that your group has in conservation and recreation activities. The letter from J. C. MacDonald that Mr. Bontempo mentioned would soon arrive. Notice it was written the same day. 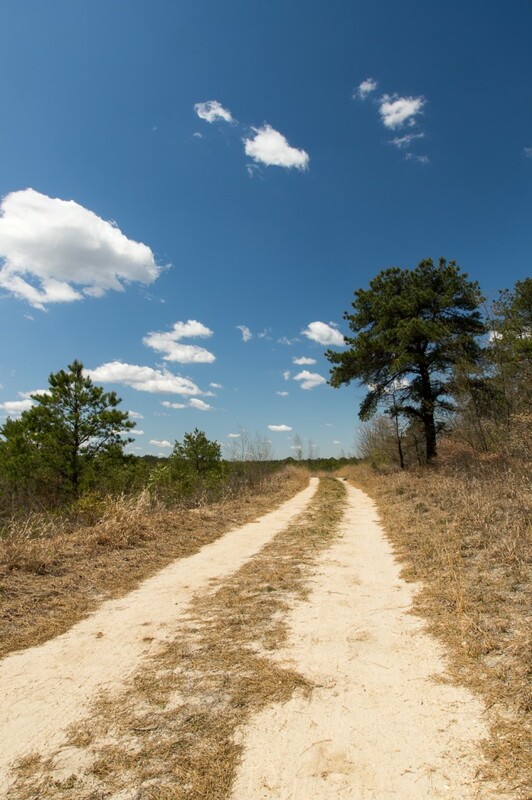 Reference is made to your letter to Commissioner Bontempo concerning the establishment of a hiking trail connecting Wharton Tract and Lebanon State Forest. We will be happy to cooperate with you in carrying out this project. We have regional maps and other information available at the Wharton Tract office at Green Bank, New Jersey (Telephone WOrth5-1367W) and will be glad to take you over the area on an inspection tour. Our office is open from 8AM to 5PM, Monday to Friday. We would prefer to have advance notice of your coming so we can have transportation available. February 18, 1961- A letter was written to Mr. MacDonald stating our plan and suggesting a meeting date. February 21, 1961- Letter received from Mr. MacDonald setting a meeting date of Saturday, March 11. February 27, 1961- Letter sent to Mr. MacDonald acknowledging the meeting date. March 11, 1961- Had meeting at Green Bank office. Mr. MacDonald couldn’t come. We met his assistant Sid Walker. We had a friendly discussion on plans. April 13, 1961- Letter written to Mr. MacDonald requesting an additional meeting on April 29, at park office. April 17, 1961- Reply received from Mr. Walker confirming meeting on April 2. April 29, 1961- Meeting held with Mr. Walker. Discussed advanced details of trail, and agreed to call it Batona Trail. May 4, 1961- Received letter from Mr. Walker informing us that Mr. J. P. Allen, Superintendent of Lebanon would like to meet with us. May 6,1961- Letter written to Mr. Allen suggesting a meeting May 20. May 8, 1961- Letter received from Mr. Allen confirming meeting. May 20, 1961- Had a friendly meeting with Mr. Allen and discussed the trail work through Lebanon Forest. May 23, 1961- Letter written to Mr. MacDonald mentioning meeting with Mr. Allen, and requesting official permission to begin trail work. May 26, 1961- Received letter from Mr. Walker giving official permission to start work on Batona Trail. July 7, 1961- Letter written to Mr. Walker to give progress report on trail work. August 15, 1961- Letter written to Mr. Walker to give second progress report. August 18, 1961- Acknowledgment of “Progress Report” received from Mr. Walker. August 19, 1961- Unscheduled meeting held with Mr. Allen of Lebanon to discuss trail work. August 26, 1961- Had meeting with Mr. Allen. We met Mr. Mitchner, Chief Ranger of this area. He inspected trial work in this area, and found it satisfactory. He and Mr. Allen agreed to build log bridge over two streams at Pakim Pond. Mr. Mitchner suggested using existing trail beyond Carpenter Spring. Dale Knapschafer and Morris Bardock checked it, and found it satisfactory. September 3, 1961- Walt Korszniak took George Sommer over the route to make sketches for the Batona schedule. October 3, 1961- Letter written to Mr. Walker for meeting to give trail mileage and discuss final details. October 9, 1961- Received answer from Mr. Walker that he couldn’t meet us on the 14th, but suggested the 21st. October 13, 1961- Wrote Mr. Walker that we couldn’t meet on the 21st because of a Catskill camping trip, and suggested October 28. October 28, 1961- Met with Mr. Walker. Settled final questions, and gave mileage for a system of signs. The next paragraph undoubtedly refers to the many parcels of land that we know of as “Chatsworth Woods,” the failed development that the brick pillars at the entrance to Ringler Ave leading to Apple Pie Hill were made for. May 13, 1961- Morris Bardock and Dale Knapschafer went to Chatsworth to see Mr. Schiess, the township tax assessor, in regard to some private parcels of land. He informed us that the land from 532 south to Apple Pie Hill was divided into small parcels, and that the owners had not stepped near the land in 30 years. He also stated that the owners would be almost untraceable without extensive research. He assured us that no one would know or care if we blazed the trail through there. The half mile trail from 532 north, to the the gravel road is owned by Mr. Sloan of Chatsworth; the third gray house before the railroad, on the right, on 563 going south. We stopped there but Mr. Sloan was not in. We spoke with Mrs. Sloan, who was most pleasant and agreeable. She told us she was sure it would be alright with her husband and she would tell him. She told us to just go ahead and put up the blazes. 1978- Added 2 1/2 mile extension at northern end, to Ong’s Hat. 1978- Added 9 mile extension at southern end, to 563, Evan’s Bridge. 1987- Added 9 mile extension to southern end, to Stage Road. During, February, March, April, and May, 1961, Walt Korszniak and Morris Bardock made exploratory trips almost every week-end to layout the route of the trail. Dale Knapschafer and Paul Peichaski took part in several of these trips. September 23-Morris Bardock, Paul Peichaski, Al & Osea McDonald made trail measurement with measuring wheel. September 30-Walt Korszniak, and Dale Knapschafer completed the trail measuring. October 14-Walt Korszniak, wife Dot, and children worked on the streams north of Carranza. This letter shows his concern about the history of the trail. Not long ago as I sat musing on Batona Trail and the early days of it’s construction, it suddenly dawned on me that no where was there any official detailed record of how the trail came to be. People in the future would be inquiring about the how, when, and why of the trail, no one would be able to answer. I felt that perhaps there aught to be an official state record of the trails history. Fortunately, I had kept a detailed running record at the time, of everything as it happened. I gathered all this together and set it up in a somewhat organized form. If you and any other related parties agree that there ought to be an official state record, or archive, on the history of the Batona Trail, please feel free to use any of the enclosed data, or any portion of it, in any way that you see fit. I hope everything has been well with you, and that everything is going smoothly in Trenton.